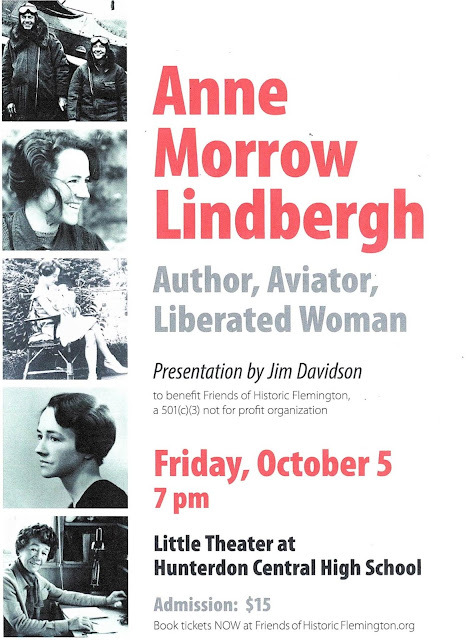 Premier Presentation of “Anne Morrow Lindbergh: Author, Aviator, Liberated Woman” - 10/5/2018 ~ The History Girl! Historian Jim Davidson is delivering, for the first time, this insightful and captivating talk about the area’s rich history and the Lindbergh legacy on Friday, October 5, 2018. Anne Morrow Lindbergh is well known for having been the wife of pioneering and controversial aviator Charles Lindbergh and mother of their six children, including Charles Jr., who was kidnapped and murdered, resulting in the Trial of the Century. This exclusive premier presentation will cover Anne’s privileged New Jersey upbringing, her whirlwind life in the spotlight, troubled marriage, retreat to Europe and pre-war Nazi connections. Often overshadowed by Charles, Anne was an accomplished aviator in her own right and a noted author, having received numerous prestigious honors and awards in recognition of her contributions to both of those fields. Her many written works included poetry, fiction and non-fiction, culminating with “Gift from the Sea,” a mainstay for many American women. Jim Davidson is President of the East Amwell Historical Society and an avid collector of Lindbergh memorabilia. Much of his collection was recently seen at the exhibit “Charles and Anne Morrow Lindbergh: Couple for an Age” at Morven in Princeton. His next book, “When the Circus Came to Town,” describes the mania that engulfed Flemington during the Hauptmann trial. This exceptional presentation will take place Friday, October 5 at 7:00 pm, at Hunterdon Central High School’s Little Theater, 84 Route 31, Flemington, NJ. Purchase tickets online at www.FriendsOfHistoricFlemington.org, or at the door. Tickets are $15. Proceeds benefit Friends of Historic Flemington, a 501(c)(3).